NAGBABALIK ang maaksiyong laro sa 43rd season ng Philippine Basketball Association (PBA) second conference. Nag-umpisa na ang Honda Commissioner’s Cup, kung saan ang 12 koponan ay may tig-1 imports. 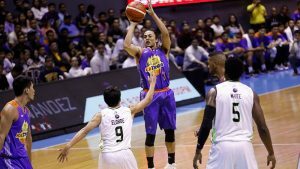 Alaska Aces, Antonio Campbell (Lakeland Magic); Barangay Ginebra San Miguel, Shane Edwards (CLS Knights-ABL); Blackwater Elite, Jarrid Famous (Meralco & Globalport); Columbian Dyip, C. J. Aiken (NBA G-Leagueas); GlobalPort Batang Pier, Malcolm White (Globalport); Magnolia Hotshots, Vernon Macklin (Brgy. Ginebra); Meralco Bolts, Arinze Onuaku (Meralco); NLEX Road Warriors, Arnett Moultrie (Team USA’s U-19 squad). Phoenix Fuel Masters, James White (Kia Mahindra); Rain or Shine Elasto Painters, Reggie Johnson (Mono Vampire & Malaysia Dragons); San Miguel Beermen, Troy Gillenwater (Mighty Sports-Philippine team); TNT KaTropa, Jeremy Tyler (Golden State Warrior). Susunod na laro: May 2 (Wed) Ynares Center-Antipolo, Globalport Batang Pier vs Blackwater Elite (2nd Game) NLEX Road Warriors vs Rain or Shine Elastopainters.